The One Thing I Didn’t Want Her To Get From Me. If you read my About Me, I mentioned that I was the pickiest eater that you’d ever meet. I really was not exaggerating. It takes a lot for me to try new things, and I usually stick to the same foods, just different variations of that food. Like chicken. I will try so many different variations of chicken, but if it has even one ingredient that I don’t like (i.e. Tomatoes or onions) then I won’t even think of eating that dish. It seems that our dear, dear child has taken the same, bland path. Poor girl. When I was pregnant, people would joke about how I was going to make Olivia become just as picky as I was and I always defended myself (though I know I didn’t have to) by denying such claims and telling them that I did not want that for her. And that was the truth. I really wanted her to have a larger food palate. Dominic and I both did. Once Olivia was born, I breastfed her exclusively. 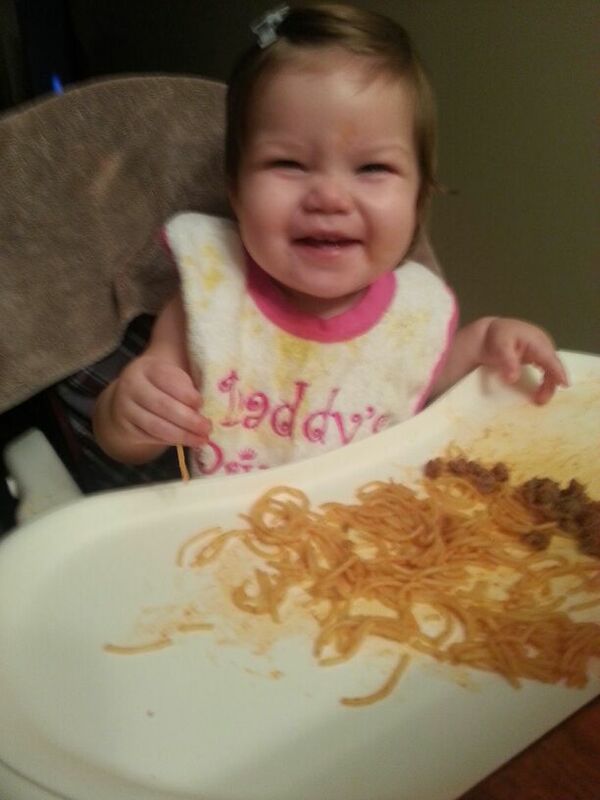 We didn’t introduce her to solids until she was 6 months old and for the first week, she ate that rice like a champ. She even tried and liked sweet potatoes and carrots. She did not like the fruits, I think she didn’t like the sweetness of them. After about 2 weeks, she would keep her mouth completely shut. She did not want the baby food. I knew that she was getting everything that she needed from breastfeeding, so we didn’t push her. When we knew that Olivia was in a good mood, we would sit her in her bumbo, and try to give her (jarred) baby food. 98% of the time, she would spit it out. I got the baby bullet as a gift from my mother before Olivia was born and I finally decided to take it out, and put it to use. I actually really loved making baby food, and I loved that I got to use my breast milk instead of water. However, Olivia didn’t like home made baby food either. Later down the road, we tried giving her little pieces of soft things, like bananas, since she still didn’t have any teeth. No dice. I will admit that I was definitely nervous to give her foods, like softened carrots or rice, because I didn’t want her to choke. 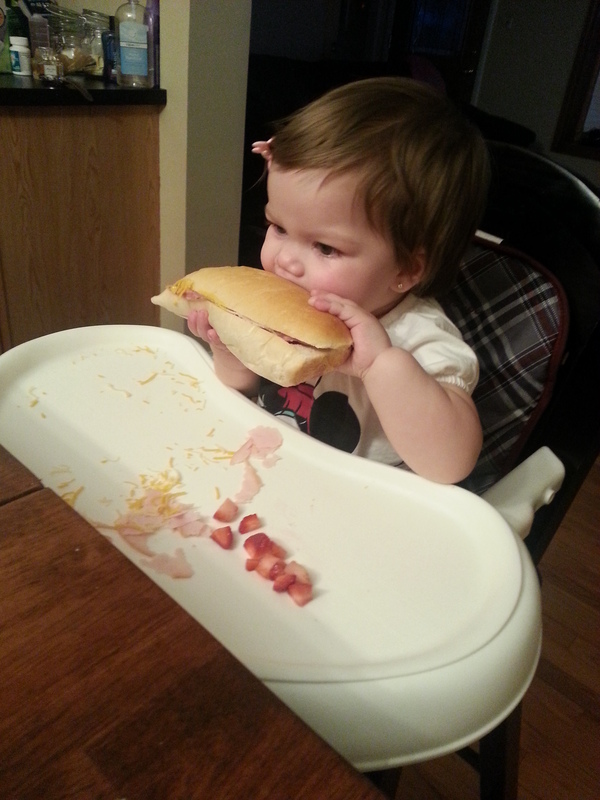 But little by little, we started giving her little tastes of food off of our plates. 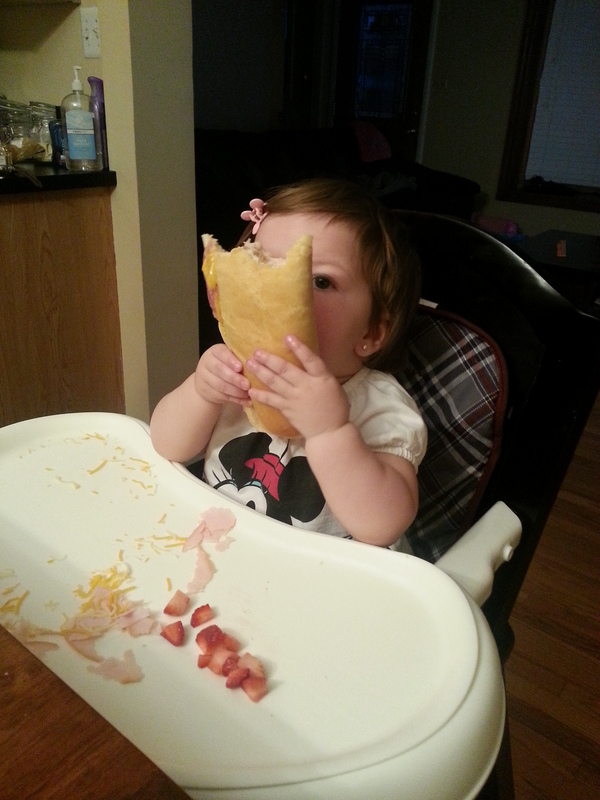 She is a carb girl, just like her mama. 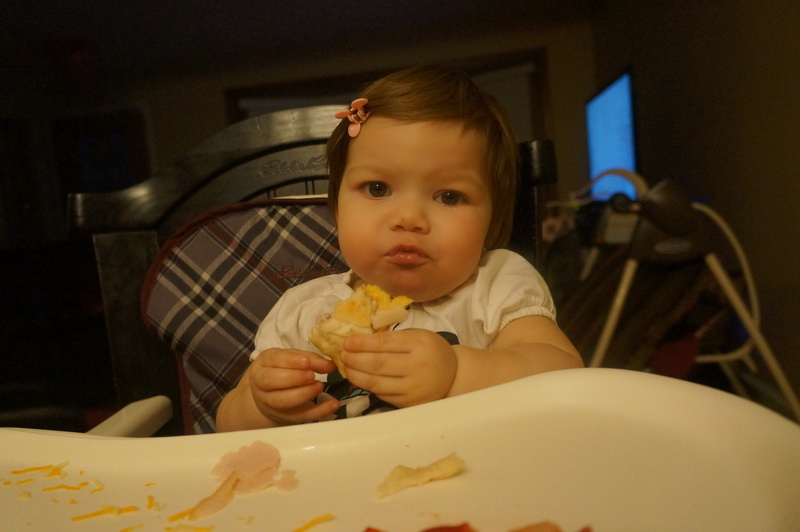 I’m serious when I say that literally the only thing she would eat at almost 10 months was mashed potatoes and bread…and she would eat Cherrios and those Gerber puffs every now and then. Getting Olivia to open her mouth to try things is like an Olympic sport. Seriously. Even the mashed potatoes. I used to have to catch her off guard, stick a little in her mouth or on her lips and if she liked it, she would willingly open her mouth for another bite. Otherwise, she would shake her whole body to tell us no. Don’t get me wrong, the shaking her little body part was adorable, but so frustrating! Now at 15 months, I sometimes still find myself having to go through great heights to get her to try something, or have her recognize that it’s actually something she likes, but, she is a little more brave about trying things without me having to do all of that. She is still very picky though. We just got her to start eating oatmeal in the mornings. And now she likes rice and peas. For a very long time she didn’t like anything sweet (she cried when we tried to give her her smash cake on her First Birthday), but of course that has changed, too. (Though we still try not to give her sweets… A little taste here and there but nothing extreme.) She likes all the things she isn’t supposed to. Like tortilla chips, and everything/anything that screams carbs. At breakfast we have Oatmeal and she’ll snack on Cheerios and granola, and for lunch and dinner we give her a variety of things to try. I try to make it colorful, and full of different flavors/textures and we leave her alone. We don’t like to bother her by saying “Olivia, please put some food in your mouth.” Instead, we talk about our days and pretend she isn’t there (although that’s pretty much impossible.) We found that by not paying attention to her, she is more apt to trying at least one of the things in front of her. We don’t want her to feel pressured. We want her to like food and want to eat it, not shove her meal down her throat. We do not push Olivia to eat anything; We’re not going to get anywhere if she is upset and/or fussy. We try to get her to try it once and if she doesn’t like it, then we wait a few days and revisit it. Or, if there are mashed potatoes involved, and I’m feeding her (as opposed to feeding herself), I’ll sneak in a small piece of chicken, or piece of carrot mixed in with the potato before giving it to her. I also try to give her things that Dominic and I are also eating that night. 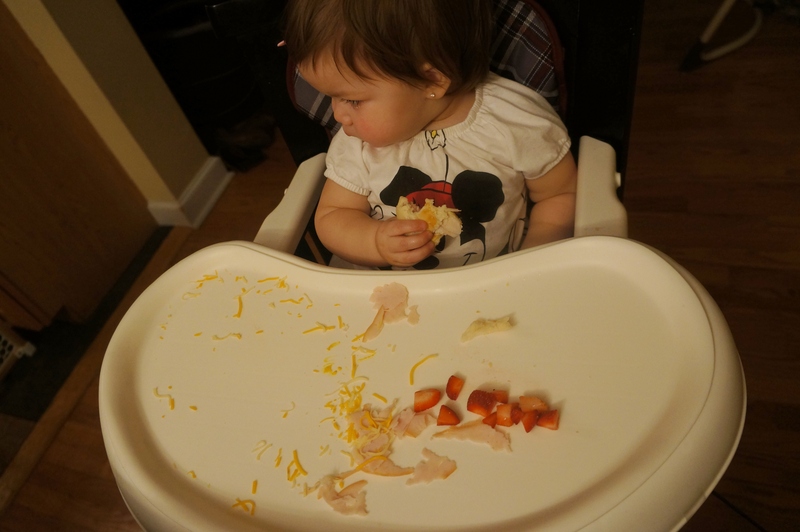 We don’t want her to grow up thinking that she is always going to have different meals than ours, and sometimes knowing that we’re eating what she is, she’ll look at me eat something, find that same thing on her plate, and then put it to her mouth. Another thing that works for us: Positive reinforcement Every time she actually puts it in her mouth, Dominic and I go, “YAY OLIVIA! You ate the ___! Good job!” and we’ll clap… and she laughs and thinks she is so cool, so she’ll put another piece in her mouth… Most of the time, anyway. I feel like I’ve tried to give her some many different foods and she just sticks to what she knows and likes and the other things she doesn’t even give a chance. Like fruit. I cannot get her to eat one kind of fruit. Not even bananas. On a positive note, not everything that she likes is bad for her. She loves corn, chicken, and ground turkey. Sometimes I can get her to eat one little sliver of a flour quesadilla, and as I mentioned above, she now likes oatmeal, rice, and peas. Every time she tries something new, I get so excited. Oh, and She’ll eat any kind of Gerber snack. And she loves pasta. But just angel hair, with red sauce. I am honestly so in shock by the characteristics she got from me. I really did not think that this eating thing would be an issue and it’s actually kind of bizarre to me. She is not even one and a half and she already knows what she likes and dislikes. Not. Okay. While we’re on the subject of Olivia and food, here’s a little story. Last night, Dominic and I had Jimmy Johns for dinner. 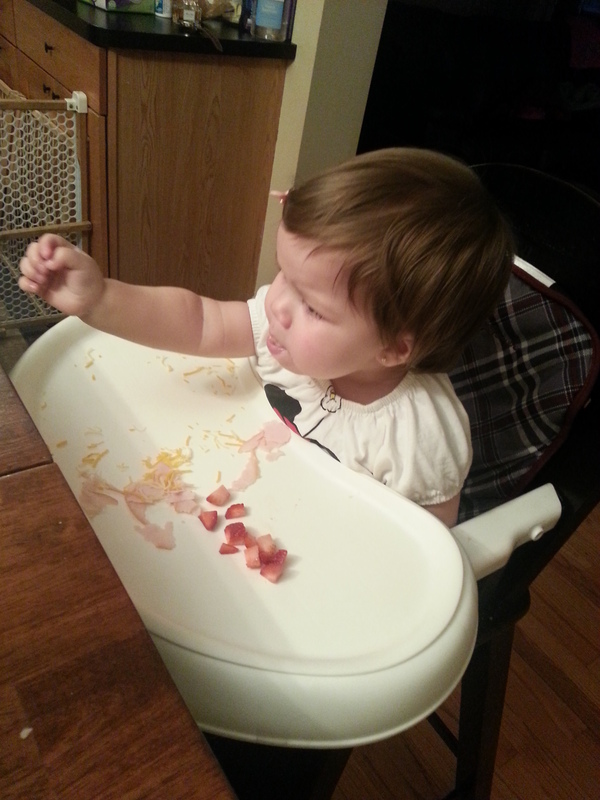 I gave Olivia pieces of turkey, a little cheese, and some strawberries. She just stared at her plate. But once I starting eating my sandwich, she pointed at it and said please, so I held it by her mouth to see if she would eat it. She took the entire thing out of my hand. Once I got it back, I ripped off a piece, gave it to her, and she ate the entire thing. Oh, Olivia, you fickle, picky little person….. Although this part of parenting is proving to be a little challenging, I look at it as learning new things about our girl, and I love that. I have looked into different recipes and I’m going to try to make some smoothies and maybe even banana muffins (I saw them somewhere this weekend, and now I cannot remember where!) 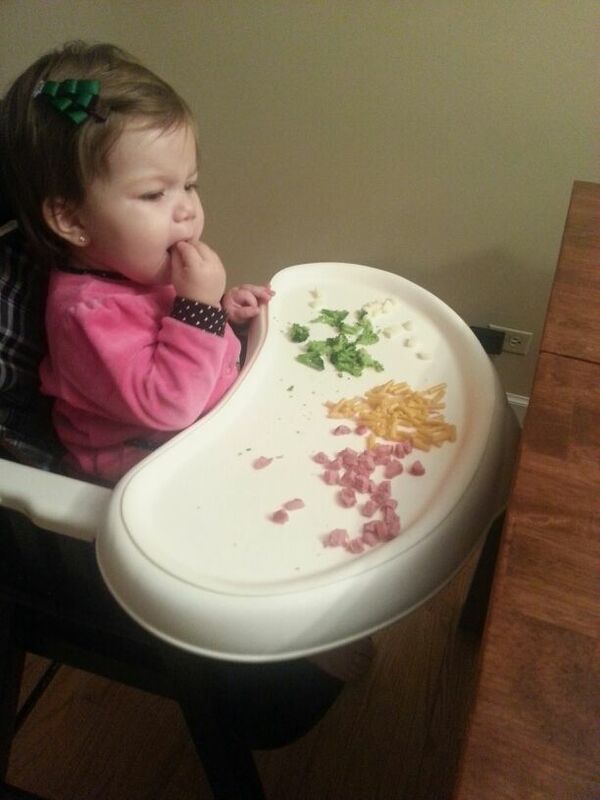 to try to get her to eat more of the nutrients that she needs. I also saw a tip over on A Cup of Jo that if you hard boil an egg and peel it, instead of cutting it up, give her the whole thing and let her squish it and break pieces off on her own, she’s more likely to eat a greater amount of the egg that way. I can’t wait to try that one. If you have any tips/tricks or if you just want to reassure me that I’m not alone with this kind of thing, I’d love to hear about it! This was such a great post! I am afraid we might have a similar situation here when our little espresso bean is born because my husband Jon is a very picky eater too when it comes to most things. I really like how you guys are going about it, I think that is a very healthy way to teach your child about food and to monitor their nutrition. Food should never be forced. Yea kids taste buds change so much and I think the way you guys are going about it is wonderful! 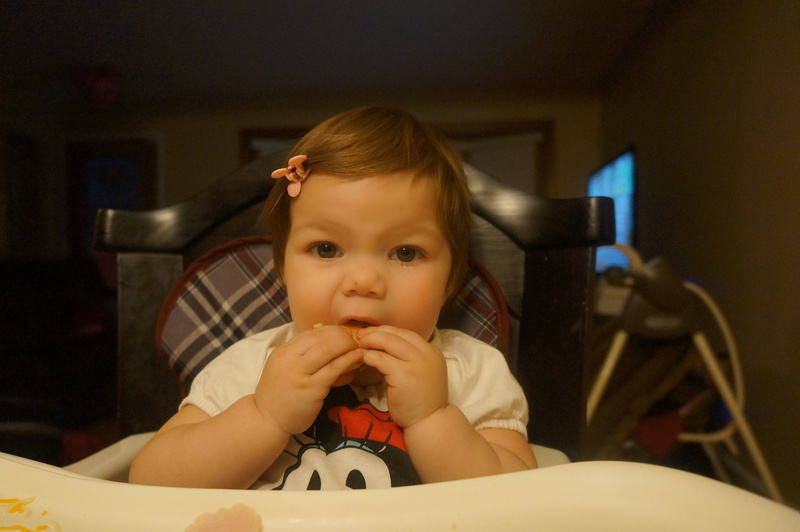 We did baby led weaning (no purees and basically everything we eat, she eats) and my 17 month old was a champ eater. Just recently she’s started refusing chicken and certain veggies. I think a lot of it is just the age, they’re starting to realize that they have control over the situation and they are taking that control. I would keep offering her a very wide variety of foods, even if she didn’t like it in the past, and eventually she’ll expand her palate.